Iryna Vakh is a talented pysankarka from Lviv who happens to be a good friend of Vira Manko. In the latter she is lucky, because Vira is a talented polygrapher, and has created a beautiful album to showcase Iryna’s work. 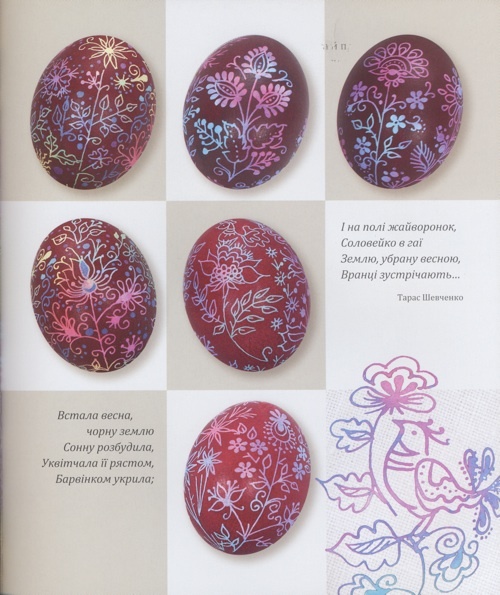 On its pages are featured hundreds of Iryna’s pysanky interspersed with poetry and epigrams. The layouts and backgrounds are gorgeous, too, and enhance the visual experience. You may have seen Iryna’s pysanky featured on the All Things Ukrainian site. She creates (and sells) pysanky using a variety of techniques. Besides straightforward linear batik, she use acid etching and complicated dye regimens to create her works. Iryna loves floral motifs, particularly sunflowers, and employs them often in her work. 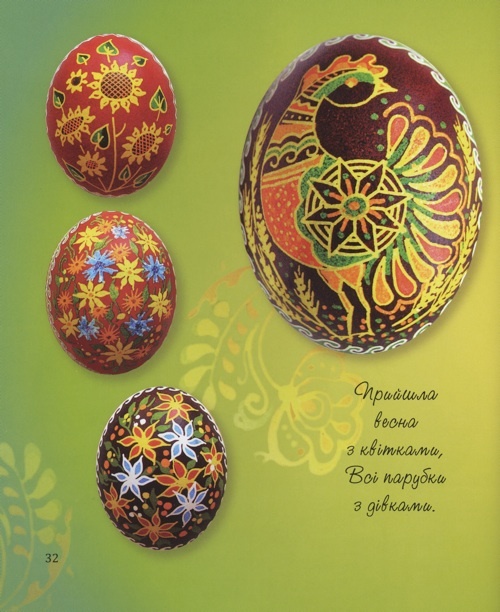 The pysanky above are a mix of traditional designs and divisions, and some very original work. The sunflower in the middle of the bottom row inspired me to create my own sunflower pysanky. She also creates beautiful millefiori-style pysanky, like the tow on the bottom left below. 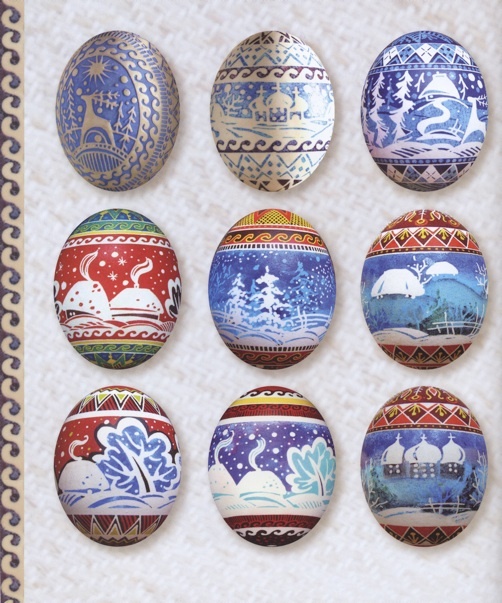 In the Horodetsky book, Vira Manko gave detailed technical descriptions of each of his pysanky–type of egg, techniques use, dye types. In this book, Vira note, she wasn’t able to do so, as the techniques were so complex that it would be difficult to describe them. 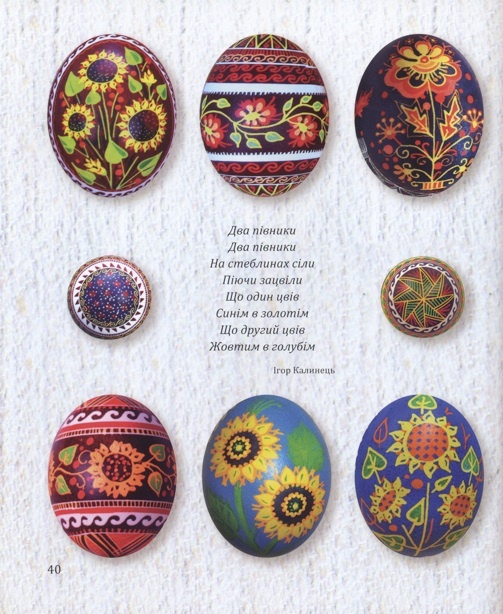 An example is the page below; these floral pysanky are like none I have seen before. Iryna has taken a white egg, daubed it with dyes to cover it in a variety of pastel colors, and then written her design. She then dyed the eggs a final color, and removed the wax. Technically, this is just linear batik, but what an effect she gets! Iryna also uses acid etching to create “travlenky” like those on the page below. This is not a traditional Ukrainian technique, at least not when it is employed on brown eggs. 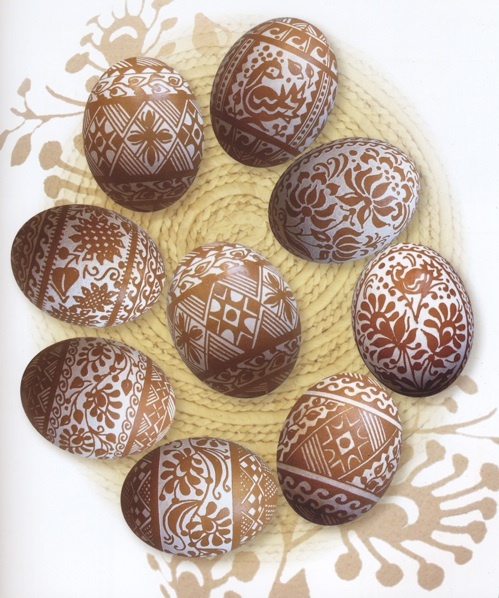 Traditional pysankary would use acid etching to create white pysanky (etching as a final step to have a white background instead of a dark one). This has become quite popular in recent years in Ukraine, though, and Iryna produces lovely eggs of this variety. What she is probably best know for, though, is her landscape pysanky. She creates lovely eggs with summer and winter landscapes; examples of winter scenes are on the page below. You can see the depth and breadth of her style here: On the top left is an egg that has been etched and dyes. On the others she has created landscapes both lithographic and painterly in nature, all with just a few dyes. And into all this she has woven traditional pysanka elements, with eternity lines (bezkonechnyky), stars and other standard motifs. And all of this beauty and creativity on just five pages. Just imagine what treasures must lie on the other ninety one! 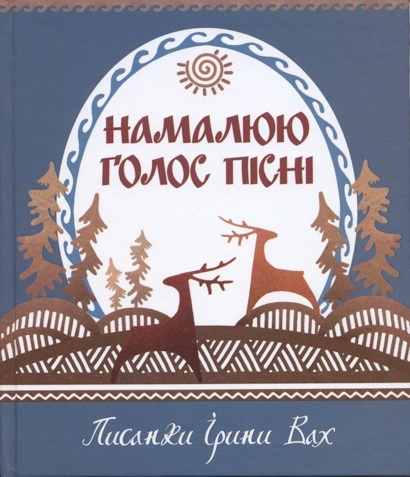 Back to MAIN Писанка Books home page. Back to MAIN Books home page.